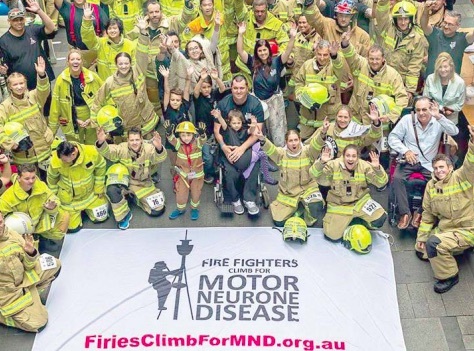 A team of firefighters from Ourimbah Rural Fire Service Brigade will be partaking in Fire and Rescue NSW’s Motor Neuron Disease fundraiser, Fire Fighters Climb for Motor Neuron Disease (MND). Ourimbah firies, Jess Farlow, Mat Shoesmith, Jordan Kolarik and John Harrison, will be taking part in the annual charity event that will see firefighters from across the state climb the 98 storeys, or 1504 stairs, of Sydney Tower, wearing full structural firefighting ensemble and air sets, with a combined weight of over 20Kg. At a vertical rise of 820 feet, the climb to the observation deck is a gruelling challenge. Each floor of the stairwell is dedicated to MND patients, both past and present. It’s a harrowing journey supporting those living with this horrific disease. The event began in 2015, raising $180,000 for MND research. So far this year, the event has raised $437,055.92 (as of October 12), bringing the total funds raised since 2015 to well over $1,700,000. This will be the second time the Ourimbah Brigade has participated in the climb, and this year’s event will hit closer to home than ever before for the volunteer firefighters, after Jess Farlow’s father, Ian Forrester, lost his battle against MND earlier this year. Floors 56 and 81 of this year’s climb will be dedicated to Forrester. The climb will take place on October 20, and the team from Ourimbah, who are participating in the climb under the team name, The Marauding Magpies, are calling on Coasties to help support the cause by donating to their Go Fund Me campaign. All funds raised from the event go to the Macquarie University MND Research Facility, the largest of its kind in Australia. As of October 12, the Magpies have raised just over $3,300 for the climb.